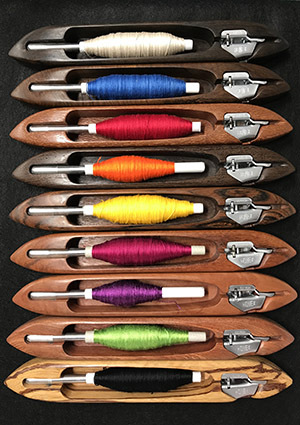 Do your brightly colored yarns look fabulous on the cone, but blend into dull, boring colors when you weave them into your handwoven cloth? Here’s a way to fix that. Pair a light yarn with a dark yarn, and presto! your handwoven design will become brighter and clearer. To understand how this works, look at the handwoven swatches below. The sample above blends bright orange with bright green. 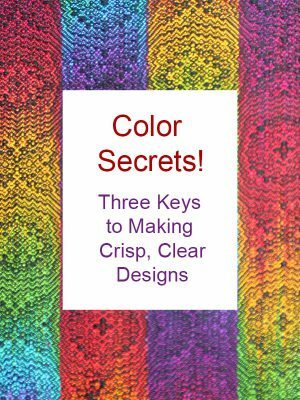 The colors are brilliant where they cross themselves, but when the orange and green interlace, they create a uniform dingy brown, and the piece as a whole is not exciting despite the brightly colored yarns. 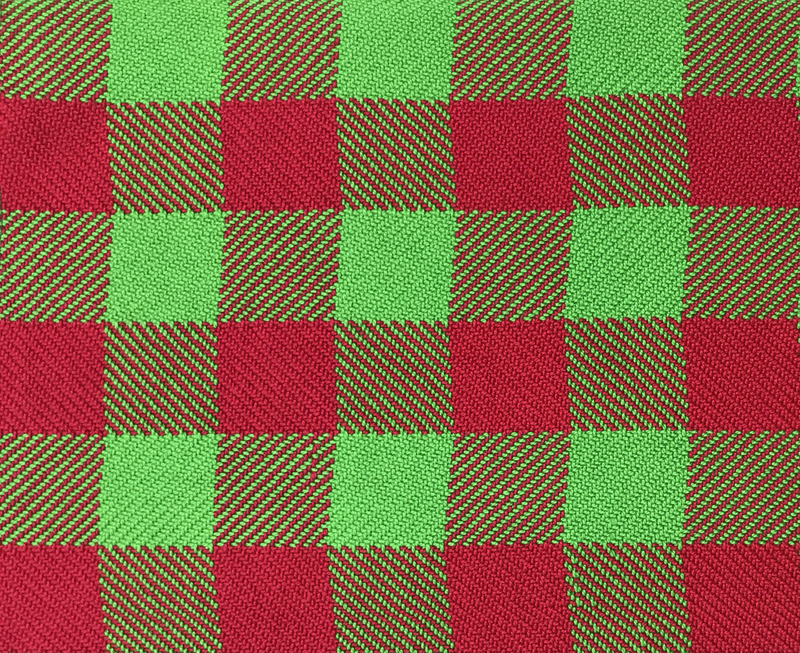 Now, here’s a swatch woven with bright green and dark red. Even though the hue hasn’t changed much, the design appears much sharper. 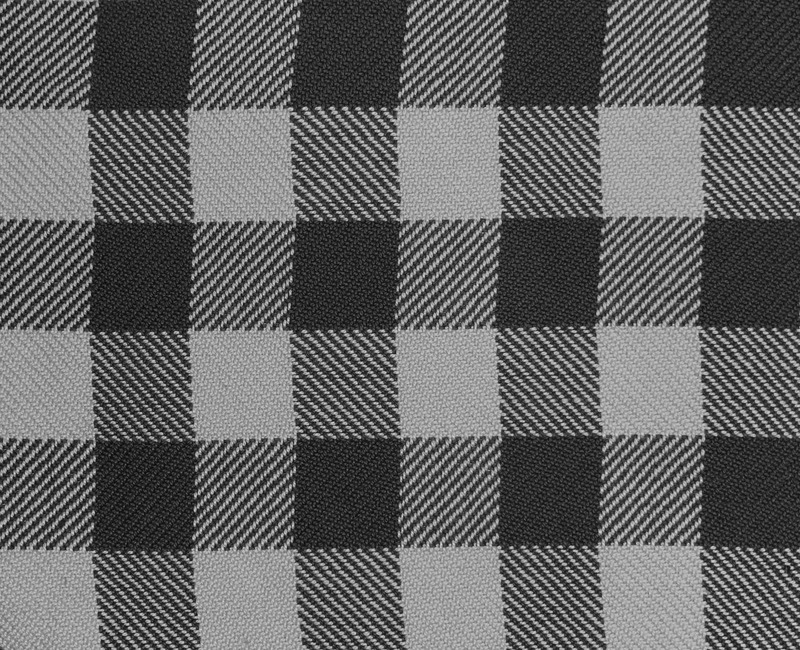 At a distance, the solid colors stand out, and the diagonal lines of the twill are clearly visible. What’s the secret? It’s very simple. 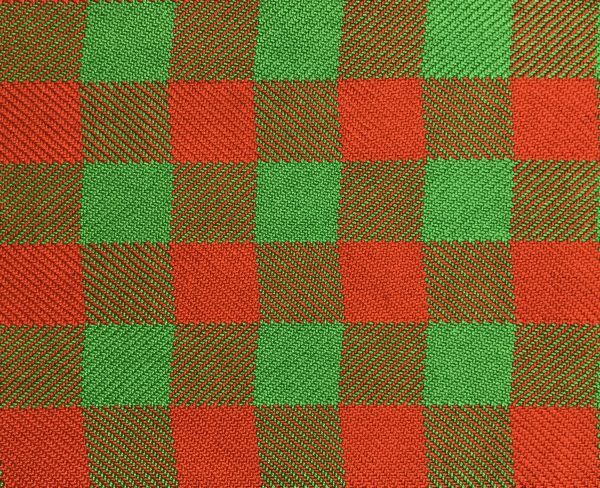 The orange and green are about equally dark, but the red is quite a bit darker than the green, so the design stands out more clearly. That’s because our eyes are much better at distinguishing lightness and darkness than at distinguishing colors. As a result, designs with strong light/dark contrast stand out much more clearly than designs with colors that are about equally dark (or light). Let’s look at both images in black and white. The green and orange design is blurry and indistinct; the red and green design shows much more clearly. Because the white is so much lighter than the green, the pattern stands out crisply. And if you use one very dark and one very light color? You get a very bold pattern indeed. Here’s a navy blue yarn woven with yellow, in the same pattern as the other samples. So next time you find your bright colors muddying…try changing to a pair of colors with strong light/dark contrast. It will help your design stand out clearly. 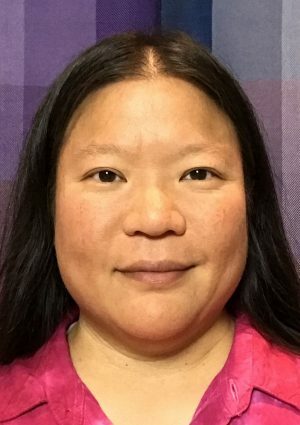 Hi Tien – Loved this tip and these examples! I tried to download the Color Confidence e-book, but could not get it to work. 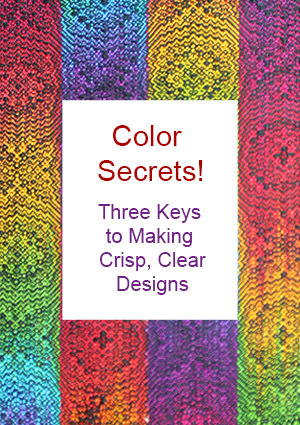 I’m planning a project for my sister-in-law for dishtowels in Color and Weave using bright spring green and a shade of gray – this helped me immensely because I was uncertain of the shade of gray – I will use either a very light gray or a very dark gray to contrast more than the medium gray I was thinking about. 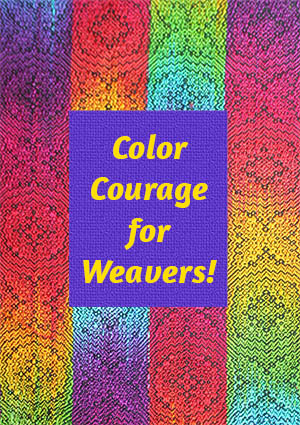 Thank you – I can’t tell you how much inspiration you have given me in my weaving and crafting in general. You are so very generous! Excellent and timely gift. Unfortunately “get the e-book” button still not working. Goes to a page asking to sign up for newsletter which I already am. I was at a meeting recently and an elderly (80+yrs) weaver said you can’t learn colour, you either have it or not. I was just thinking about putting a little workshop together for them to help “Learn”. Glad the post was useful for you! You’ll have to sign up again in order to get the e-book – but don’t worry, you won’t get double emails if you do. Thanks Tien, I’ve passed this on to my weaving group in Bay of Plenty, New Zealand so hope you have lots of customers. This makes so much sense! I love learning about color and I feel like you are a storehouse of information. Can’t wait to keep learning more!